Formerly called “Lomé la belle”, Togo's capital has for some years been transformed into a garbage dump of all kinds. However, associations like Attac-Togo are creating hope by going in for public awareness on environmental issues. With just over 800,000 inhabitants, the city of Lomé, like most cities in Togo, is overwhelmed by the weight of waste. For a decade, landfills have been multiplying in connection with a galloping demography and it’s no longer a surprise for anyone to learn that the country’s capital is losing its status as “Togo’s cleanest city”. Aware of this situation, several organisations, have decided to tackle this problem that affects everyone. This is the case with the alter globalist association Attac-Togo, whose action is now visible in Lomé. In just a few months, the association has succeeded in reducing the number of wild dumps in the city; it also wants to work with young people to prevent the birth and development of other dumps. Achieving sustainable development through better management of urban waste, is the association’s main challenge but it wants to raise awareness first. For this, the alter globalist intends to rely on young people, who represent 60% of the population (according to the latest census in 2012), and thus the future of the country. 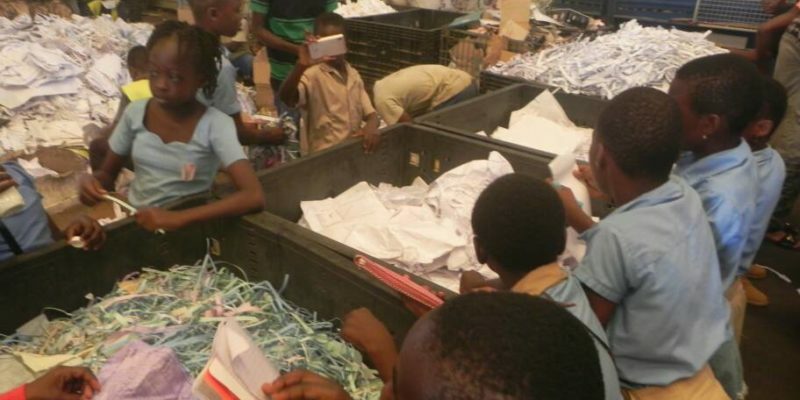 The last week of March 2018 was dedicated to “Sustainable Development Week”, with the bonus of a visit to AGR-Togo, a company that collects and processes waste in Lomé. In the same run, Attac-Togo will organise a writing competition on environmental issues. The aim here is to raise awareness among young people on the issues of sustainable development and climate change.